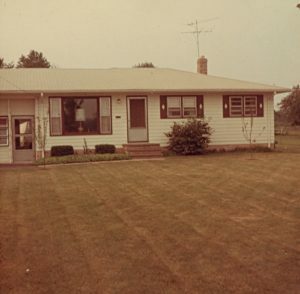 This picture, taken in 1967, was the house we lived in North Ridgeville, Ohio, from 1960 to 1972. It is on the corner of Bainbridge and Chestnut Ridge Road. Our family moved into the new house on Labor Day weekend, 1960, along with our next-door neighbors – our two dads worked together at United Airlines, and the two new houses were built by the same contractor. Originally only the house was built, with a slab foundation laid for a garage. Later the garage was built, leaving an open breezeway. Later we enclosed the breezeway, turning it into a porch. We moved in 1972 to a house on Boulder Drive in North Ridgeville. The family who bought it from us only moved in 2016. And our neighbors, who moved in the same time as us in 1960, still live there.